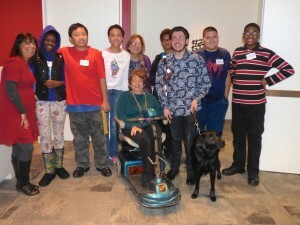 Author Linda Noble Topf, who is wheelchair-bound due to Multiple Sclerosis, recently motivated fourth and fifth grade able-bodied students from Philadelphia’s Nebinger School and special needs students from The Pathway School in Norristown to find their inner strength a program called Empowering Youth in 2016. It took place on Friday, Jan. 8, at the National Liberty Museum in Philadelphia. 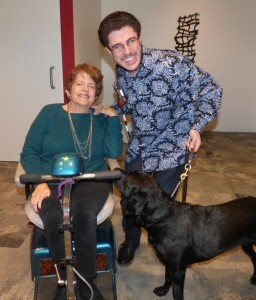 Joining Linda was 19-year-old, blind musician/singer Rocco Fiorentino of Voorhees, who demonstrated that physical challenges have not held him back. His segment on Sesame Street, taped when he was 12 years old, was also shown to the students. Fiorentino, 19, of Voorhees, now a sophomore at Berklee College of Music in Boston, was born four months premature with less than a 5 percent chance to live. Because he needed 100 percent oxygen in his incubator to survive, he lost his sight, but he never lost his vision.